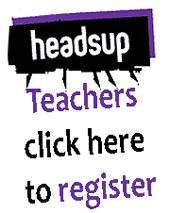 Please take our evaluation survey and tell us what you think of HeadsUp and how we can improve. It will only take 5 mins and will help us support you better! Creating your own teacher avatar and teaching your students online and offline in an engaging way! Would a £25 gift voucher encourage your students to get (more) involved with HeadsUp and be more engaged with the subjects up for debate? We have created a reward for the HeadsUp user that we judge has been the best poster on each forum. It's not just about the sheer amount of posts but about the quality and creativity of the posts as well as good interaction with other users. For more information on the judging criteria and the prizes up for grabs click here. Any queries, requests for support or reminders of lost/forgotten log-in details should be directed to Beccy Allen, Project Manager at the Hansard Society. Contact can be made via our contact form. Alternatively you can phone . Full details of the Society can be found on the website - www.hansardsociety.org.uk. Lesson ideas relating to the current and previous debates. Student notes for the current and previous debates containing facts, figures, terms and other background information.